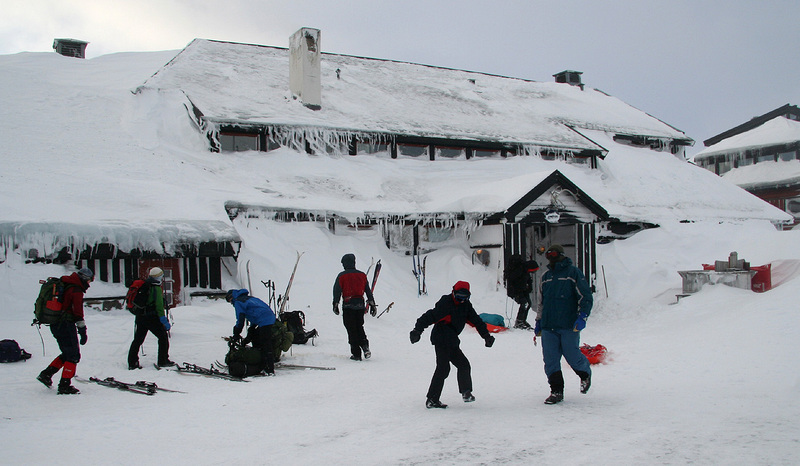 How to get there: The best starting point is the DNT self-serve hut Hallingskeid. This hut is right next to the station Hallingskeid on the Bergen to Oslo railroad. The hut has a high standard with electricity and full kitchen, a very popular place. Route description: From Hallingskeid, ski north, then follow the pretty distinct little valley that drains a small lake just below 1300 meter. On the east side of this little lake, climb the gentle slope towards east, but stay a bit north, close to the summer trail that is marked on the map. That is, aim for the north-west side of lake Skomavatnet (1416 meter). In this way you avoid the potential hazardous snow cliffs that build up just south of this route (around N60:40.826, E007:16.861). The west end of the lake also has a snow cliff cornice, descend to the lake on the north side of it. Cross the lake to its east end. From here, one may either ski north-east and then climb the peak along its broad north ridge, or one may proceed south-east, reach the south ridge and ascend from this direction. There are several cairns, the largest one located just at the Hordaland - Sogn og Fjordane county border. Comments: This trip turned out very differently from what was planned. Already back in November I signed up for a Bergen Fjellsport (Bergen mountaineering club) trip to Syrdalsbreen. I had always wanted to explore that area on skis. The fact that the highest point of Syrdalsbreen has a prominence of 651 meter and ranks as number 449 in Norway certainly added motivation. However, the forecast called for possible storm and in any case (very) strong wind, therefore on Thursday evening the trip was changed to Hallingskeid. We travelled from Bergen by train arriving around 1830. The organizeres (Birte and Øystein) had prepared an excellent Mexian dinner. The goal for Saturday was agreed to be Storskavlen with a high point of 1729m, it ranks among the higher mountains north of Hallingskeid. We were 12 that started out at 0800 with fairly decent conditions. We skied up to and across the small lakes just north-west of Skomahøgdene, through a distinct saddle before descending towards lake Svartavatnet (1264m). Almost down and Espen broke his ski in a fairly standard bump. The ski broke just behind his heel, bad news. It was agreed that he should turn back and that he needed company. I voluntered and thus Espen and I skied back reaching the hut shortly after 1100. The weather turned worse while we were skiing back with poor visibility and an increasing wind. It seemed early to end the skiing of the day, so after a brief lunch I set out at 1200 with the objective to see if I could visit Skomanosi, this peak looked like it could be in range. I had brought my laptop along to Hallingskeid, so I could plan a route and enter a number of waypoints into my GPS before leaving the hut. The wind was not too bad, but the visibility soon disappeared altogether, resulting in what is called very flat light and essentially no way to see where you are going. Good to have the GPS waypoints, I decided to continue and basically ski from one waypoint to the next. Shortly before crossing a small lake at about 1300 meter, I skied straight off a snow cornice, perhaps 2 meter high. This easily happens under such conditions and calls on great attention, since it may be potentially hazardous. I realized that skiing with the prevailing wind from behind, the buildup of these traps were indeed very likely whenever approaching a dip in the terrain. My straight line GPS route crossed a pretty innocent looking depression with a small creek. At the very last moment, I noticed the steep snow cliff in front of me and stopped before falling over. I carefully looked down and probed with my two ski poles attached together. No, it seemed pretty far down, certainly more than 4 meter possibly more like 6-8 meter. I decided to ski uphill and explore a way around. Doing so, while keeping the edge just within reach of my right ski pole, I carefully proceeded. Suddenly, the whole ridgeline collapsed and I avalanched down among many pretty large blocks of snow. The whole event certainly proceeded somewhat more smoothly than a direct fall, but with enough drama to increase the pulse significantly. Everything came to rest and I crawled out and concluded that the problem of getting down had been solved, however in a way that met with strong disapproval. I continued more carefully than ever towards the west end of lake Skomavatnet. It seemed a bit longer than expected, I was skiing with the GPS unit in my hand and just as I took another look at the display, I skied off my third snow cliff of the day. This one came without warning, about 4 meter high, but fortunately with a soft and somewhat steep landing area. Boy, what a trip, it seemed pretty clear that I should not have any more incidents like this. With bad luck one may destroy a ski and then it would be a long and difficult way home. Skiing on the lake was nice and predictable, I hoped that the rest of the trip would proceed in a somewhat more orderly fashion. The following ascent to the south ridge of the mountain was easy, however the ridge itself looked a bit steep and skiing back down (with close to zero visibility) did not seem appealing. Thus, I left my skis behind and continued on foot. It was a short and easy ascent to a more flat area. I continued more gently uphill and located a cairn quite close to a somewhat higher knoll. Proceeding from there to the map marked summit which also serves as a point of reference on the Hordaland - Sogn og Fjordane county border, I found another large cairn. Careful measurement of the elevation gave 1649 meter, quite a bit higher than the map elevation of 1640. There was really no need to spend time up there in white out conditions. I had arrived at 1420, almost 2.5 hours after leaving the hut and I wanted to be back around 1600, before it got really dark. The trip back was uneventful. I had learned my lessons and skied in a rather wide loop to the north of the trouble area with steep snow banks. I arrived back at the hut at 1600, about 1.5 hours after my group that had turned back before reaching the summit of Storskavlen. The next day came with strong wind. (In fact, most of southern Norway was hit by a full storm.) We decided that the best trip would be to ski to the Finse railroad station further east, thus getting the wind largely from behind. This was again a bit besides my original (lack of!) plan, since I had brought extra stuff along thinking that it could be left at the hut while we were skiing. Thus, I carried my laptop as well as a complete extra set of clothing to Finse. It may be the first carry of a laptop computer along this route under stormy, January conditions. Again, a member of the group going first, fell off a snow cliff, this time breaking his ski upon landing. It also broke behind the binding and fortunately, could be used to reach Finse. A heavy toll on equipment with two broken skis in a single weekend outing. We arrived at Finse around 1300, a good effort in 5 hours with almost no visibility and wind in the 15-20 meter/second range. Thanks are due to Birte Haugland and Øystein Ormåsen for organizing the trip, we all experienced REAL winter, a season that so far has been completely absent in the Bergen area. Bergen Fjellsport, we have just arrived at Finse. The local snowplow, keeping the tracks open. 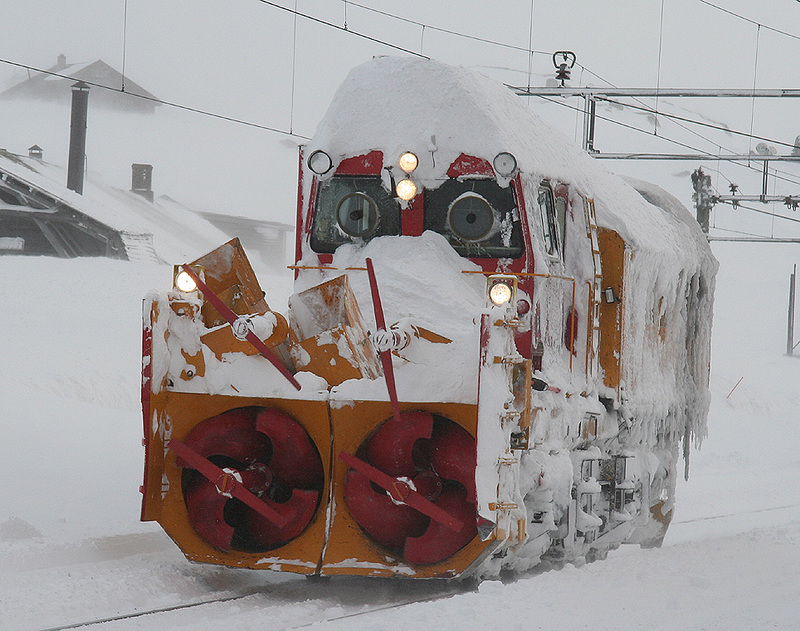 Finse, railroad station in January.